Remember the last lobster fake-out on 2frugalfoodies? We’d have to be crazy to put real lobster on a website devoted to eating frugally…right? Trader Joe’s to the rescue….no surprise. They sell, at least where we live, Langostino (which we talked more about at the bottom of the above link) for a really good price. We are super proud of this meal. We did it! We mastered phyllo dough. There are a lot of bloggers out there talking smack about phyllo dough… but really, you can handle it. Just be focused and careful. 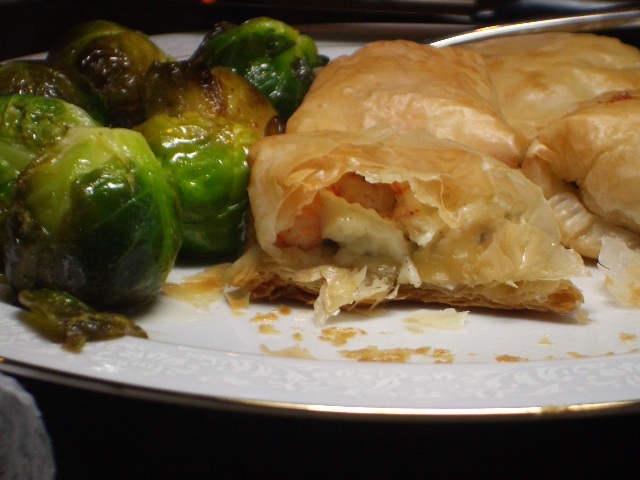 Not only did we master crazy-thin dough, we put lobster and brie in it and baked it. and it all melted together. and. if that doesn’t make you drool, you’re crazy. Enough – take a look. And make this. ENJOY! Your pictures are amazing – I am starving now and need to go find something for dinner!